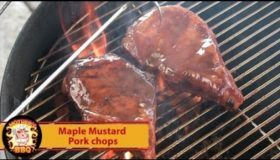 On this video, we fire up the Weber Kettle and grill up some awesome Maple Mustard Glazed Pork Chops. This glaze would go awesome on an Easter Ham. Enjoy! Tags: bbq, busy mom recipes, chops, cider, cook, cooking, cooking recipes, cuisine, dessert recipes, dinner, dinner recipes, easy, easy recipes, economical recipes, Food (TV Genre), glaze, glaze (ingredient), glazed, healthy recipes, How to cook, kitchen, lunch recipes, maple, meat, noreen's kitchen, orange juice, pieguy's kitchen, pieguy3, pork, pork (food), pork chop (ingredient), quick and easy recipes, recipe, recipes, salad recipes, simple, slow cooker recipes, syrup, vinegar, what's for dinner?